Walker Hill may not be too spectacular, but what's in the neighborhood sure is. 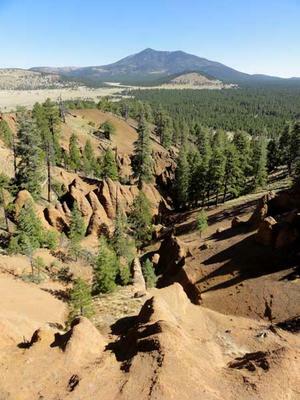 Lava River Cave, Wild Bill Hill and Government Prairie make this corner of the Coconino National Forest stand out indeed! And the views of San Francisco Mountain and Kendrick Mountain just add icing to the cake. 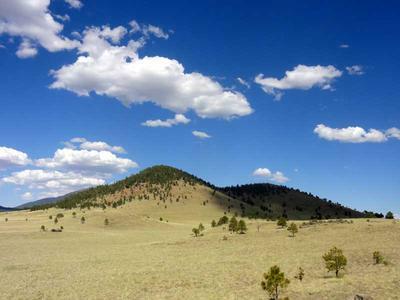 RV campsites are plentiful here along Forest Road 171 north of Bellemont near Flagstaff, Arizona. Campsite Directions: From Flagstaff take I-40 west to exit 185, which is north of the Navajo Army Depot. After exiting take a right, then a quick left on Brannigan Park Road / FR 171. Continue about ¾ mile then turn right onto FR 171. Go about 0.65 miles to the campsite on the right. Recreation: There are plenty of places to explore here. Lava River Cave is a must do! I hiked up nearby Walker Hill, and further up the road, Wild Bill Hill. There are excellent views from Wild Bill Hill and some neat looking hoodoos. I also biked across Government Prairie, now this is a must-see! It’s a huge prairie with grassy hills, forested hills, and superb views in every direction. Kendrick Mountain and San Francisco Mountain are easily visible here. Cross country hiking is easy everywhere. There are several primitive forest roads to explore on mountain bike. Wild Bill Hill Hike Directions: Take FR 171 north to FR 156 and turn left. After about 2 miles you reach a T-intersection, turn left and go through the gate. Follow the road and take the 1st left that goes around the mountain. You’ll see another track to the left, with the trailhead sign. Weather: It’s a bit chilly at night here. It’s been down into the 30s every night. It’s colder here than in Flagstaff and other spots I’ve camped in near town. The days have been perfect though and in the 70s, perhaps 80 on a few days. I’ve had plenty of sun and only a few clouds on a couple days. A few days have been windy, but the forest really blocks much of that wind so it’s mostly in the treetops. No rain has fallen. Privacy: The small road I’m camped off of only sees a car every 3 days or so, mainly on weekends. This road doesn’t go anywhere, so no real traffic. Cell Signal: My Verizon cell phone signal is great. Verizon mobile broadband internet works excellent. It’s much faster here than to the west near Williams and Ash Fork. I’m not getting full bars, but watching videos is still possible. I have been using the external antenna place on my RV roof. Wildlife: I haven’t seen any deer or elk, though I do see tracks along this minor forest road. I’ve seen rabbits, squirrels, many different birds including robins, ravens, and hummingbirds, and lizards (some mountain short horned lizards). RV Campsite Rating: 9 out of 10. There is much to do here and it’s a spectacular area for camping. Join in and write your own page! It's easy to do. How? 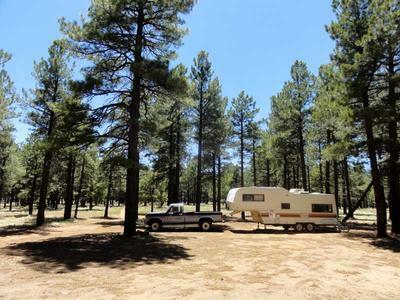 Simply click here to return to Free Arizona RV Parks.